This week, Cherry Hill adopted an important new policy that will ultimately make our community safer and more accessible for everyone. Called "Complete Streets," this new initiative requires that the Township evaluate all future street and sidewalk projects to determine whether they should include pedestrian, bicycle and transit accommodations such as sidewalks, bicycle lanes, crosswalks, pedestrian control signalization, curb cuts and crosswalks. In short, Complete Streets promotes joint use of our roadways by all users, including pedestrians, motorists, bicyclists, seniors, children, and those with limited mobility. By improving access for everyone, Complete Streets enhances safety while promoting a healthier community and a cleaner, greener transportation system with less traffic congestion and improved air quality. This is good government and smart planning, and I'm proud that Cherry Hill has joined the Complete Streets movement. Click here for additional information. 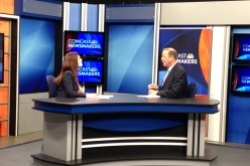 On Wednesday, I joined Comcast Newsmakers at their Cherry Hill studios to discuss the Mayor's Wellness Campaign and our community's recent designation as a Healthy Town. As you know, the Mayor's Wellness Campaign has been tremendously successful in its first two years, encouraging residents across town to get moving and incorporate healthy habits in their lifestyles. The campaign and its overwhelming response in our community has helped Cherry Hill to be just one of 17 towns in New Jersey - and the only town south of Trenton - to be officially certified as a Healthy Town by the New Jersey Healthcare Quality Institute's Mayors Wellness Campaign. Stay up-to-date on the Mayor's Wellness Campaign via Facebook, or by visiting www.CherryHill-NJ.com/wellness. Click here to view the full Newsmakers interview. PSE&G plans lane closures next week on Cuthbert Blvd. Next week, PSE&G will be closing one lane of Cuthbert Boulevard near Hampton Road as part of an ongoing infrastructure improvement project. Lanes will be closed one at a time, in the following order: Northbound inside lane, Northbound outside lane, Southbound outside lane, Southbound inside lane. Work is scheduled from 7 a.m. to 5 p.m., Monday through Friday. Cherry Hill Police will assist with traffic control. As always, please use caution and drive slowly when traveling through a work zone. As part of an ongoing water main replacement project, New Jersey American Water will begin working on Waverly Road between Roanoke and Old Orchard Roads on Tuesday, April 1, weather-permitting. Service will not be affected other than for a short period of time when individual service lines will be connected to the newly installed water main. Homeowners will be notified when that brief shutoff is scheduled to occur. Access to homes and driveways will be maintained throughout the duration of the project. For concerns about this project, please contact John Graham or Jacquelyn Weaver at (856) 764-6920 or 6915. New Jersey American Water will continue work on a main transmission line along Springdale Road through the week of April 7. Lane restrictions will be in place 24 hours a day, 7 days a week, between Justa Lane and the Springdale Farm Market. During construction, Springdale Road will be limited to one lane in each direction through the work zone. Delays are expected, and drivers are asked to utilize alternate routes for the duration of the project. Springdale Farm Market is open and accessible during work. South Jersey Gas will continue underground infrastructure upgrades next week near the intersection of Evesham and Berlin roads, on the Cherry Hill-Voorhees border. For approximately one month, crews will be working to upgrade natural gas infrastructure underground from 7 p.m. until 5 a.m., Monday through Thursday. Work will take place in phases on each approach to the intersection (both directions on Evesham and Berlin Roads, and on Somerdale Road), with lane shifts and closures implemented as necessary. The roads will remain open to traffic, but drivers should anticipate delays and plan accordingly. As always, please drive slowly and exercise caution when traveling through the work zone. Register now for spring Recreation classes! Registration is now open for all spring programs offered through the Cherry Hill Department of Recreation. There are dozens of programs for the entire family this season, including dance, fitness, mommy-and-me classes, painting, drawing and much more. Explore our full roster of spring activities for residents of all ages by clicking here. To register for a program, visit https://reconline.cherryhill-nj.com/. For additional information, call (856) 488-7868, or email Recreation@chtownship.com. Lego Club: Mazes, 2:30-4 p.m.
Join us for an afternoon of cool construction featuring Lego bricks. We'll provide all building supplies, you bring the creativity! For ages 5 and up. Parents can play, too! No registration required. March is Red Cross Month! In just 15 minutes, you can save up to three lives! Blood shortages are occurring all across our region and every two seconds someone needs you. If you are in good health, at least 17 years old and weigh at least 110 pounds, now is the time to roll up your sleeve and donate. Every type can save a life! Click here to make an appointment online. Walk-ins also welcome. Learn the convenience and fundamentals of spreadsheets. This class focuses on the basics of creating Excel spreadsheets. Use a spreadsheet to stay organized at home and work, to create a family budget, or to make a simple shopping list. Free, but registration is required. Click here or call (856) 903-1246 to register. Would you like to learn how to use Microsoft Word to write letters, papers, resumes and much more? Learn the basics of word processing in this hands-on class. Attendees will learn to enter and edit text, control cursor movement, select text, save and open documents, use shortcuts like cut and paste, and choose and format fonts. Free, but registration is required. Click here or call (856) 903-1246 to register. - For a complete list of free computer classes offered at CHPL, visit their website for class descriptions, dates and times. The Art Blooms juried art exhibit will be held April 26 - May 10 at the Croft Farm Arts Center, 100 Bortons Mill Road. This annual juried art exhibit will feature original two-dimensional works in watercolor, pastels, oils and more. All artwork is available for sale and neither Cherry Hill Township nor the Cherry Hill Arts Board take a commission. This exhibit is open to artists of all ages and abilities. Simply complete the prospectus and bring it along with your works of art to the Croft Farm Arts Center on Wednesday, April 23 between 4 and 7 p.m. There is a $10 per entry (maximum 3 entries) non-refundable jury consideration fee. Artwork will be juried that night and artists will be notified by Friday, April 25 if they are accepted into the show. For more information, call (856) 488-7868 or email Arts@chtownship.com. For more information on Art Blooms or other activities and events planned by the Cherry Hill Arts Advisory Board, click here. 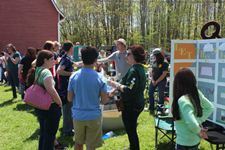 More than 5,000 people are expected at the 5th annual Cherry Hill Art Blooms Earth Festival, from 10 a.m. to 2 p.m. on Saturday, April 26 at historic Croft Farm. This free event puts the focus on sustainability, gardening, recycling and more with engaging displays by schools, businesses, crafters, performers and non-profit groups. This year’s displays will include several from Cherry Hill schools, including Johnson Elementary School’s new community garden, which was started in part thanks to a $1,000 Darden Restaurants Grant. Festival visitors can bring extra plants from gardens or purchase new plants to take home at the “plant exchange” offered by Sustainable Cherry Hill’s Gardening task force. Children will be able to plant a flower to take home while moms and dads ‘shop’ at the plant exchange. Visitors can bring containers to shovel some free Cherry Hill Township compost to use in gardens. In addition, vegetable and flower seedlings from Camden’s Center for Environmental Transformation and Springdale Farm will be available for purchase. Event updates are available at www.sustainablecherryhill.org. The festival is made possible in part by generous presenting sponsors: Hutchinson Plumbing, Heating and Cooling, LourdesCare of Cherry Hill and Ravitz Family Foundation; Leadership sponsors include: Sustainable Camden County, Investors Bank, M. Rosenblatt Roofing and Flaster Greenberg. For more Earth Festival information, contact Brenda Jorett at Brenda@brendajorett.com. The Cherry Hill Police Department reminds residents that expired and unused household medications should not be discarded in your regular trash. Instead, the Township has partnered with the New Jersey Attorney General’s Office to take part in Project Medicine Drop, a secure and anonymous way for residents to dispose of medication 24 hours a day, 7 days a week, 365 days a year. Since April 2012, the Department has collected over 1,160 pounds of medication. The Medicine Drop box is located in Police Headquarters, 820 Mercer St. Contents are secured and ultimately destroyed by authorized law-enforcement officers. Project Medicine Drop boxes only accept household medications that are in solid form; liquid medication and powders cannot be accepted. Drug addiction often begins in the medicine cabinet, and prescription drug overdoses are an increasing epidemic across New Jersey. Thank you in advance for helping to combat this troubling trend. For more information on this program, click here, visit www.NJConsumerAffairs.gov/meddrop, or call the Cherry Hill Police Department at (856) 488-7828. The Cherry Hill Education Foundation is pleased to present the 2014 “Dancing with the Cherry Hill Stars” on Sunday, May 4 at 7 p.m. in the Auditorium at Cherry Hill High School West. Sixteen couples, including teachers, students, school administrators, alumni and members of the business community, will compete in an exciting contest to raise money for the Cherry Hill Public Schools. Special performances by the Cherry Hill School Board (with students), and by last year’s “Jersey Boys” will enhance the show. Guest celebrity judge Jeremiah Trotter will join the judges’ table with Marjie Major, Katie Nanni and Arnie Silver. Music by East’s Orchestra will add to the elegance of this “Hollywood” evening. Tickets are available online at www.cherryhilleducationfoundation.com or in the Activities Offices at Cherry Hill High School East and West. Online voting for your favorite dancing couple is also available on the Education Foundation’s website. The Cherry Hill Fire Department will continue going door-to-door this weekend, offering residents free smoke alarm testing and installation. Firefighters will be visiting homes on Abington Road, Abington Terrace, South Mansfield Boulevard, Mt. Pleasant Way and Roumfort Avenue on Saturday, and on Kingston Drive (Chelton Pkwy to Route 70), Salem Road, Plymouth Drive and Lowber Drive on Sunday. The list of locations is updated each week on the Department’s website and Facebook page. Check back often to see when the CHFD will be in your neighborhood. If you are in need of a smoke alarm immediately, please call (856) 429-7441 to schedule an appointment. Camden County wants to hear from local residents to make sure the health and well-being needs of individuals impacted by Superstorm Sandy are addressed. To assist in this effort, the County has issued a survey that will assess the effectiveness of the original outreach for Superstorm Sandy. Although Camden County was less affected than other areas in the state, there were several dozen residents in Cherry Hill that registered for assistance through the Federal Emergency Management Agency (FEMA). There may be other residents in the County who did not seek assistance for property damage because they were unaware, encountered barriers to assistance, or were overwhelmed by the event and continue to have unmet needs. Click here to read more and to take the survey. Registration is now open for Camden County’s free Parenting Conference on April 12 at Pennsauken High School, sponsored by the Camden County Board of Freeholders. This great event features two sessions of interactive workshops, exhibitors, brunch, face painting, balloon animals, fabulous door prizes and more. The keynote speaker is June Grushka Rosen, a life coach who will talk about how families can coach each other to greatness. Click here for the list of workshops and to register. Cherry Hill and Camden County have partnered to once again offer free Chair Yoga classes for Township seniors! These classes are designed to help incorporate yoga into your day, regardless of your experience level. Chair Yoga will take place in the N. John Amato Council Chambers (Room 208) at Town Hall from 1-2 p.m. on April 2, 16, 30 and May 7. An additional date will be added in the future. For more information, call instructor Barbara “Teddy” Piotrowski at (609) 217-4018. To register, call (856) 488-7868, or email Recreation@chtownship.com. Camden County also offers Healthy Cooking Classes, a Spring Fling Senior Dance and other events for seniors throughout the spring. Click here for the full schedule of free events. Registration is now open for all spring programs offered through the Cherry Hill Department of Recreation. There are dozens of programs for the entire family this season, including . including dance, fitness, mommy-and-me classes, painting, drawing and much more. Explore our full roster of spring activities for residents of all ages by clicking here [http://www.cherryhill-nj.com/DocumentCenter/View/2146] . To register for a program, visit https://reconline.cherryhill-nj.com/ [https://reconline.cherryhill-nj.com/] . For additional information, call (856) 488-7868, or email Recreation@chtownship.com [mailto:Recreation@chtownship.com] . March is Red Cross Month! In just 15 minutes, you can save up to three lives! Blood shortages are occurring all across our region and every two seconds someone needs you. If you are in good health, at least 17 years old and weigh at least 110 pounds, now is the time to roll up your sleeve and donate. Every type can save a life! Click here [http://www.redcrossblood.org/make-donation-sponsor?date%5bmin%5d%5bdate%5d=&date%5bmax%5d%5bdate%5d=&field_sponsor_code_value=cherry%20hill%20library] to make an appointment online. Walk-ins also welcome. Learn the convenience and fundamentals of spreadsheets. This class focuses on the basics of creating Excel spreadsheets. Use a spreadsheet to stay organized at home and work, to create a family budget, or to make a simple shopping list. Free, but registration is required. Click here [http://host6.evanced.info/cherryhill/evanced/eventsignup.asp?ID=5418&rts=&disptype=&ret=eventcalendar.asp&pointer=&returnToSearch=νm=0&ad=&dt=mo&mo=4/1/2014&df=calendar&EventType=ALL&Lib=&AgeGroup=ALL&LangType=0&WindowMode=&noheader=&lad=&pub=1&nopub=&pa] or call (856) 903-1246 to register. Would you like to learn how to use Microsoft Word to write letters, papers, resumes and much more? Learn the basics of word processing in this hands-on class. Attendees will learn to enter and edit text, control cursor movement, select text, save and open documents, use shortcuts like cut and paste, and choose and format fonts. Free, but registration is required. Click here [http://host6.evanced.info/cherryhill/evanced/eventsignup.asp?ID=5424&rts=&disptype=&ret=eventcalendar.asp&pointer=&returnToSearch=νm=0&ad=&dt=mo&mo=4/1/2014&df=calendar&EventType=ALL&Lib=&AgeGroup=ALL&LangType=0&WindowMode=&noheader=&lad=&pub=1&nopub=&pa] or call (856) 903-1246 to register. - For a complete list of free computer classes offered at CHPL, visit their website [http://www.chplnj.org/events/computer_classes.htm] for class descriptions, dates and times. The Art Blooms juried art exhibit will be held April 26 - May 10 at the Croft Farm Arts Center, 100 Bortons Mill Road. This annual juried art exhibit will feature original two-dimensional works in watercolor, pastels, oils and more. All artwork is available for sale and neither Cherry Hill Township nor the Cherry Hill Arts Board take a commission. This exhibit is open to artists of all ages and abilities. 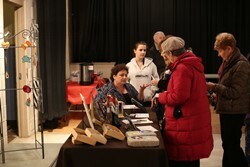 Simply complete the prospectus [http://nj-cherryhill.civicplus.com/DocumentCenter/View/1342] and bring it along with your works of art to the Croft Farm Arts Center on Wednesday, April 23 between 4 and 7 p.m. There is a $10 per entry (maximum 3 entries) non-refundable jury consideration fee. Artwork will be juried that night and artists will be notified by Friday, April 25 if they are accepted into the show. For more information, call (856) 488-7868 or email Arts@chtownship.com [mailto:Arts@chtownship.com] . 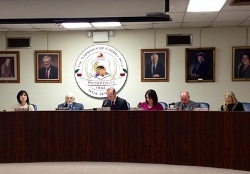 For more information on Art Blooms or other activities and events planned by the Cherry Hill Arts Advisory Board, click here [http://cherryhillarts.blogspot.com/2014/01/annual-art-blooms-juried-art-exhibit.html] . More than 5,000 people are expected at the 5th annual Cherry Hill Art Blooms Earth Festival, from 10 a.m. to 2 p.m. on Saturday, April 26 at historic Croft Farm. This free event puts the focus on sustainability, gardening, recycling and more with engaging displays by schools, businesses, crafters, performers and non-profit groups. This year’s displays will include several from Cherry Hill schools, including Johnson Elementary School’s new community garden, which was started in part thanks to a $1,000 Darden Restaurants Grant. Festival visitors can bring extra plants from gardens or purchase new plants to take home at the “plant exchange” offered by Sustainable Cherry Hill’s Gardening task force. Children will be able to plant a flower to take home while moms and dads ‘shop’ at the plant exchange. Visitors can bring containers to shovel some free Cherry Hill Township compost to use in gardens. In addition, vegetable and flower seedlings from Camden’s Center for Environmental Transformation and Springdale Farm will be available for purchase. Event updates are available at www.sustainablecherryhill.org [http://www.sustainablecherryhill.org/] . The festival is made possible in part by generous presenting sponsors: Hutchinson Plumbing, Heating and Cooling, LourdesCare of Cherry Hill and Ravitz Family Foundation; Leadership sponsors include: Sustainable Camden County, Investors Bank, M. Rosenblatt Roofing and Flaster Greenberg. For more Earth Festival information, contact Brenda Jorett at Brenda@brendajorett.com [mailto:Brenda@brendajorett.com] . The Cherry Hill Police Department reminds residents that expired and unused household medications should not be discarded in your regular trash. Instead, the Township has partnered with the New Jersey Attorney General’s Office to take part in Project Medicine Drop, a secure and anonymous way for residents to dispose of medication 24 hours a day, 7 days a week, 365 days a year. Since April 2012, the Department has collected over 1,160 pounds of medication. The Medicine Drop box is located in Police Headquarters, 820 Mercer St. Contents are secured and ultimately destroyed by authorized law-enforcement officers. Project Medicine Drop boxes only accept household medications that are in solid form; liquid medication and powders cannot be accepted. Drug addiction often begins in the medicine cabinet, and prescription drug overdoses are an increasing epidemic across New Jersey. Thank you in advance for helping to combat this troubling trend. For more information on this program, click here [http://www.cherryhill-nj.com/DocumentCenter/View/1458] , visit www.NJConsumerAffairs.gov/meddrop [http://www.njconsumeraffairs.gov/meddrop] , or call the Cherry Hill Police Department at (856) 488-7828. 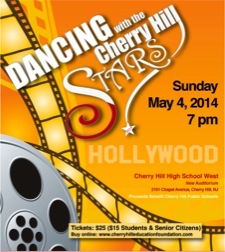 The Cherry Hill Education Foundation is pleased to present the 2014 “Dancing with the Cherry Hill Stars” on Sunday, May 4 at 7 p.m. in the Auditorium at Cherry Hill High School West. Sixteen couples, including teachers, students, school administrators, alumni and members of the business community, will compete in an exciting contest to raise money for the Cherry Hill Public Schools. Special performances by the Cherry Hill School Board (with students), and by last year’s “Jersey Boys” will enhance the show. Guest celebrity judge Jeremiah Trotter will join the judges’ table with Marjie Major, Katie Nanni and Arnie Silver. Music by East’s Orchestra will add to the elegance of this “Hollywood” evening. Tickets are available online at www.cherryhilleducationfoundation.com [http://www.cherryhilleducationfoundation.com/] or in the Activities Offices at Cherry Hill High School East and West. Online voting for your favorite dancing couple is also available on the Education Foundation’s website. The Cherry Hill Fire Department will continue going door-to-door this weekend, offering residents free smoke alarm testing and installation. Firefighters will be visiting homes on Abington Road, Abington Terrace, South Mansfield Boulevard, Mt. Pleasant Way and Roumfort Avenue on Saturday, and on Kingston Drive (Chelton Pkwy to Route 70), Salem Road, Plymouth Drive and Lowber Drive on Sunday. The list of locations is updated each week on the Department’s website [http://www.cherryhillfire.blogspot.com/2013/12/2014-smoke-alarm-campaign.html] and Facebook page [https://www.facebook.com/pages/Cherry-Hill-Fire-Department/249480684755?ref=br_tf] . Check back often to see when the CHFD will be in your neighborhood. If you are in need of a smoke alarm immediately, please call (856) 429-7441 to schedule an appointment. Camden County wants to hear from local residents to make sure the health and well-being needs of individuals impacted by Superstorm Sandy are addressed. To assist in this effort, the County has issued a survey that will assess the effectiveness of the original outreach for Superstorm Sandy. Although Camden County was less affected than other areas in the state, there were several dozen residents in Cherry Hill that registered for assistance through the Federal Emergency Management Agency (FEMA). There may be other residents in the County who did not seek assistance for property damage because they were unaware, encountered barriers to assistance, or were overwhelmed by the event and continue to have unmet needs. Click here to read more and to take the survey [http://camdencounty.us1.list-manage2.com/track/click?u=3ec82ce3aeb0b82c62064d641&id=a0f35ba826&e=8b5625feaf] . Registration is now open for Camden County’s free Parenting Conference on April 12 at Pennsauken High School, sponsored by the Camden County Board of Freeholders. This great event features two sessions of interactive workshops, exhibitors, brunch, face painting, balloon animals, fabulous door prizes and more. The keynote speaker is June Grushka Rosen, a life coach who will talk about how families can coach each other to greatness. Click here for the list of workshops and to register [http://camdencounty.us1.list-manage.com/track/click?u=3ec82ce3aeb0b82c62064d641&id=9fb2fda9a1&e=8b5625feaf] . Cherry Hill and Camden County have partnered to once again offer free Chair Yoga classes for Township seniors! These classes are designed to help incorporate yoga into your day, regardless of your experience level. Chair Yoga will take place in the N. John Amato Council Chambers (Room 208) at Town Hall from 1-2 p.m. on April 2, 16, 30 and May 7. An additional date will be added in the future. For more information, call instructor Barbara “Teddy” Piotrowski at (609) 217-4018. To register, call (856) 488-7868, or email Recreation@chtownship.com [mailto:Recreation@chtownship.com] . Camden County also offers Healthy Cooking Classes, a Spring Fling Senior Dance and other events for seniors throughout the spring. Click here for the full schedule of free events [http://www.camdencounty.com/health/senior-and-disabled-services/senior-recreation-calendar?utm_source=] .